Baaro Baaro Muddina Nalla Lyrics | Nanna Devaru: Baaro Baaro Muddina Nalla is a song from the 1982 Kannada movie Nanna Devaru directed by B. Mallesh and written by R. Selvaraj. The film was produced by K. S. Ashok under the banner Rajeshwari Bhagya Kalamandira Combines. Nanna Devaru starred Ananth Nag, Sujatha, Tiger Prabhakar, K.
Dundu Mallige Mathadeya Lyrics | Nanna Devaru: Dundu Mallige Mathadeya is everegreen super hit song from the 1982 Kannada movie Nanna Devaru directed by B. Mallesh and written by R. Selvaraj. The film was produced by K. S. Ashok under the banner Rajeshwari Bhagya Kalamandira Combines. 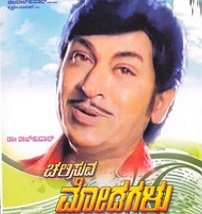 Nanna Devaru starred Ananth Nag, Sujatha, Tiger Prabhakar, K.